Exceptional print quality: the Xaar 502 GS15S and the revolutionary PrecisionPlus architecture deliver smooth tints, graduations and excellent edge definition for printing text and graphics. Industrial reliability: the Xaar 502 GS15S printhead is designed to deliver industrial reliability and robustness resulting in increased production up-time even in harsh environments. High production up-time: the internal architecture of the printhead enables quick and easy priming, automatic nozzle priming and self-recovery, all resulting in higher productivity and less ink waste. Reach higher levels of performance in Wide-Format Graphics (WFG) with the Xaar 502 GS15S printhead. Whether printing large exterior banners or indoor point-of-sale material, this premium printhead delivers exceptional print quality, excellent reliability and high production up-time. 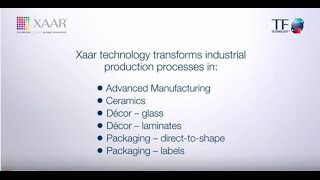 The unique PrecisionPlus architecture of the Xaar 502 printhead family builds on Xaar’s incredibly successful Hybrid Side Shooter architecture, proven in the market-leading Xaar 1003 printhead. This new architecture optimises the actuator performance giving more uniform drop formation and stability across the print swathe and therefore exceptional print quality for stunning graphics. Print service providers will appreciate the even, flat tints and sharp text achievable with the Xaar 502 GS15S. For OEMs the remarkable uniform print swathe allows printheads to be mounted together easily. This, along with a combination of other innovative features, ensures trouble-free integration, fast time-to-market and short servicing times. This printhead family can also be used to print fluids used in the Advanced Manufacturing and 3D market sectors. The piezo inkjet technology used in these printheads is capable of printing fluids with a range of viscosity, reactivity and conductivity. Xaar can support you in choosing the right printhead for the fluid type and for the application vs. the performance specification and price.